Just in time for New Year! Ok so we made sure that we gassed up the truck, and snow thrower. I went out in the snow last night and out of 5 members in the garden club just 3 of us enjoyed something sinful. It was so nice to travel a road alone in the quiet and then snow fell lightly. I had my first Chi Latte LOVED IT and a piece of chocolate decadence cake. The chief said “I thought you were going to go sinful that is even gluten-free!” lol I just hope the plate was heavy she place it on or I will have to go shovel another 2 hours before weigh-in Tuesday! OK I am hurting real bad from head to toes so let me add your EYE CANDY so I can go watch TOM BRADY, man is he handsome and a nice guy, my EYE CANDY. Have to make my way out to add water for the birds it’s been so cold the river froze over. 6 AM this yellow beast was in my hand making pathways for JT to use as well as places to spread cracked corn and black sunflower seeds for all the ground feeders. Now as you can see we did not get buried but 12 inches more than I want ALL WINTER! Now the pretty abstract of ice and tree reflections upon the river are gone and replaced with snow. When the sun comes out I will try to find a pretty spot for you till then watching boyfriend behind the machine and Tom on TV LIFE IS GOOD! Snow falls in Sandy Creek, N.Y., Friday morning. 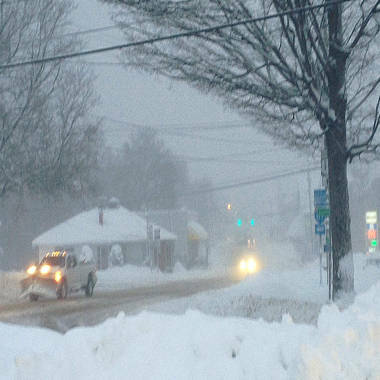 There’s a travel mess ahead from the Midwest to New England where some areas will see up to eight inches of snow. Meteorologist Janice Huff reports. The Northeast braced Friday for a fierce winter storm that threatened to dump a foot of snow on some places and coat New York and Boston over the weekend with their biggest accumulations of the season. Lake-effect snow whipped Buffalo and Rochester, N.Y., and Erie, Pa., on Friday morning, and 5 to 8 inches of snow was expected to fall on parts of Illinois, Indiana and Ohio from Friday evening into Saturday. Indianapolis was expected to get as much as 5 inches. Brrrrr it was cold here the last two days in New Hampshire. Below Zero! Warming up they say we may hit 30 maybe time to hit the BEACH. Jackson Hole’s Corbet’s Couloir requires guts; reward is skiing glory.